The above image is the upscaled version that fits the size of the RPG Maker versions of the Time Fantasy packs. 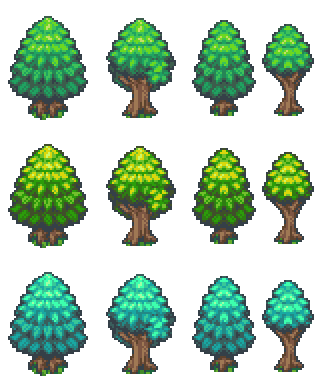 Here are the regular-sized trees if you want those instead. 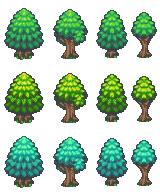 I was originally going to make a decorated Christmas tree as the free resource, but I decided that it would be better to release something more versatile, and more tree varieties are something that have been requested a bunch of times. Have fun with them, and Merry Christmas. Wonderful Christmas gift! Thanks a lot man! I’m still using your graphics packs to the fullest. I can only hope the images get re-uploaded since they are gone now. I would love to see and possibly use this with the other Time Fantasy set. I figured it out, just a second ago. Firewall issue on my end. Love this set so much.